Interactive Brokers (IB) is somewhat of a household name in the world of financial trading, and if you have ever watched CNBC for more than 30 minutes, you have almost certainly seen the ads for it. In this Interactive brokers review, we’re going to take a closer look at what lies behind the curtain. Usually, when a product or service is a market leader, it’s a good indicator that it’s superior in some way to the competition. But that’s not always the case, and we can’t assume it is so with Interactive Brokers. In this review, we will put this well-known broker under the microscope and dissect it piece by piece. Is it all it’s cracked up to be? Does it fall down in any specific areas? We’ll find out in this review. Who Should Consider Using It? Interactive Brokers is known for two key elements, those being it’s international trading platform, and low fees and commissions. It’s a professional level trading platform that, while it could be used by ambitious beginners and somewhat experienced traders, is much better suited to those who are looking for serious opportunities on international, and even exotic, markets. IB has two different trading platforms, with the advanced one being the Traders Workstation (TWS). The trading tools available are great on the whole, but one of the things most investors prefer about TWS is that you can customize it, including making use of third party plugins and apps to suit your trading style. It’s used by tens of thousands of traders worldwide, and allows you to access markets in 24 countries, with securities including pretty much the whole spectrum from equities to bonds, to forex, and commodities. That’s a quick overview of what Interactive Brokers offers and is all about. Now lets look at all of this in a little more detail. Interactive Brokers isn’t for beginner traders, who will find it way beyond their needs and abilities. It provides a large range of opportunities to trade all over the world, and using its advanced features will require a steep learning curve. It’s best to master the fundamentals before moving onto a platform like this. For beginner traders, there are some much better options out there, such as eToro (which unfortunately though is not available for US traders). The low commissions make this platform great for active traders, and the international capabilities make it ideal for advanced level traders who like to stray outside the everyday lines in search of greater profits. It’s also definitely for those seeking to save on commissions, which is probably most traders. Interactive Brokers commissions are some of the lowest in the entire industry. Like all platforms, Interactive Brokers isn’t perfect and while there are lots of great features and things we like, there are also a few things we don’t. Global Trading - IB allows you to trade on more than 100 markets in 24 countries. If you’re tired of playing the FTSE and NASDAQ and want to try something more exotic, it will give you that ability. Custom Orders - There are over 30 different types of orders you can place on all of your trades. This blows the typical buy/sell orders out of the water. Small Spreads - On top of low commissions, the spreads are small. This can’t be underestimated as bigger spreads eat profits and make it harder to make one in the first place. Excellent Education Centre - You can learn an incredible amount from IB’s educational material. There are guides on so many things related to trading, investing, and the platform itself. They also come in video and written form, so they will suit all types of learner. Paper Trading - You can trade with $1,000,000 in paper money before you risk your own capital. While it’s only for play and learning, this is significantly more than most brokers offer in paper accounts. Low Margin Rates - Nothing will cause fear and losses faster than a margin call. IB’s margin rates are lower, reducing the chances of one being made. Security - IB is akin to a digital Fort Knox. Nobody is breaking in here. Your personal information and accounts contents will be safe. It makes use of SSL encryption and is very safe. Charts - They aren’t absolutely terrible, but we have seen much better. As compared to the standards of the rest of the platform, the charts let it down. Barriers to Entry - You will need at least $10,000 to open an IB account, hence it might not be an appropriate option for those with lower funds. Advanced Level - You will need to know a fair amount already and be somewhat seasoned to get the best from your IB account. That said, there is actually a great educational section, so you could always fill in the gaps there. Clunky Reporting - Getting access to your statements and reports is inconvenient, requiring you to go into another section of your account. Most other brokers keep everything in one place. Slow Execution - Some IB customers have reported slow order execution. This could be an extremely serious issue if it happened at the wrong time and could be costly. No Phone Support on Saturdays - While this is not a major concern, it should be kept in mind that phone support is not available on Saturdays. Interactive Brokers allows you to invest in a large range of securities all across the world. You can access markets in 24 countries from America to Europe to Asia-Pacific and beyond. Equities - You can trade stocks and shares from around the world. Bonds - Corporate and government bonds are both on offer. ETFs - You can trade a wide range of ETFs at IB, and can even pick ones which mirror the performance of mutual funds you are interested in. Forex - You can trade global currencies including the popular pairs and some more exotic pairs, too. Futures - Futures trading is available on a truly global range of commodities like precious metals and oil. Indices - From the FTSE to the DAX to the DJIA, you can trade indices from around the world. Options - There are lots of options trading choices at IB. Whether you want to place a trade that lasts seconds of days, you will be able to do so. You can also trade these securities across a large range of markets from the NYSE in America to the FTSE MIB in Italy, to the ASX in Australia. The sheer range of investment offerings at IB is one of its strongest points. This is why it will appeal to advanced, global traders and investors who think outside the box. You can trade just about anything here and the range far outweighs what’s on offer at many other brokers. What’s on offer will be of most benefit to advanced level traders and not beginners, who may feel overwhelmed by the sheer number of possibilities and some of the exotic markets. Again, we don’t think IB is best for those just starting out. There are various fees and commissions at IB, but it is renowned for having some of the lowest in the industry. It’s difficult to think of a category of trader this wouldn’t appeal to. Note, prices differ depending on markets. This list is for US markets and international markets can differ substantially. There are also fixed and tiered fee structures. Shares - 0.005 per share. There’s a minimum fee of $1 per order and a maximum order fee of 0.5% of the order. ETFs - There are many commission free ETFs available to trade. Options - Fees range from 0.25 to 0.70 per contract, depending on the size of the trade. There’s a minimum fee of $1 per order. Futures - Fees depend on the exchange being traded on and what’s being traded. They range from $0.15 per contract to $15.00. Forex - Again, fees depend on the size of the trade. For trades under $1,000,000,000 the fee is 0.20 basis point 3 * Trade Value 4.Trades worth more than $5,000,000,000 incur fees of 0.08basis point 3 * Trade Value 4. Metals - All metals incur a fee of 0.015 basis point 1 * trade value. There’s a minimum fee of $2.00 per order. Bonds - For trades less than $10,00 face value the fee is 0.1%* Face Value (10 bps) 1, 2. For trades greater than $10,000 face value it is 0.025%* Face Value (2.5 bps) 1, 2. Mutual Funds - Mutual funds trading follows a simple two-tiered structure. There are fee-free funds, and funds which incur a $14.95 transaction fee. These fees are much lower than what can be found elsewhere. For example, with regards shares, the price per x100 shares is $1 at Interactive Brokers, where the nearest competitor (Fidelity) charges $7.95 for the same 100 shares. These fees are great for active, high volume traders, who will struggle to find a more competitive platform than IB. 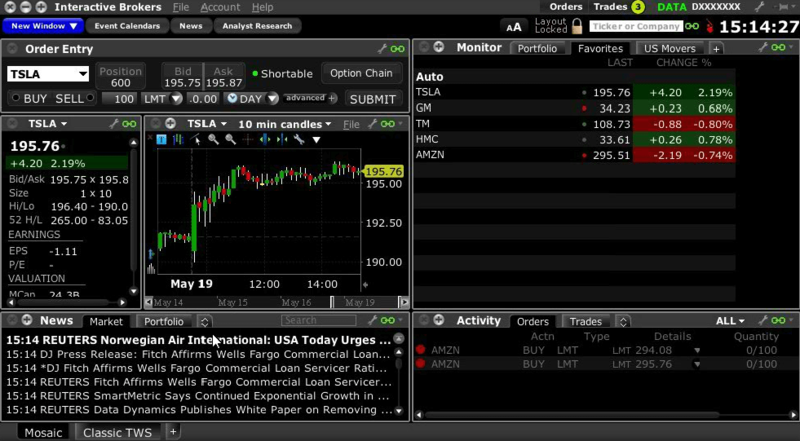 There are actually two Interactive Brokers platforms - the Trader Workstation (for desktop) and WebTrader. In this section, we will take a closer look at both and assess their usability and features. This platform needs to be downloaded to your desktop, but it is worth doing as it’s the more advanced of the two and has certain features which you will want to take advantage of. The Trader Workstation is Java based and can seem a little complicated, to begin with. If you feel confused by it, there are some good learning materials in the educational section which can quickly bring you up to speed. You can utilize either mosaic or classic views. The former allows you to customize and put together relevant windows showing the information you need (this can be done hassle-free and quickly by clicking the blue ‘new window’ button). The classic view looks somewhat like an excel spreadsheet, albeit black and purple in colour, making it very simple and easy to use. The platform also allows you to utilize third-party plugins in some areas. For example, the charting isn’t the best, so many traders add NinjaTrader and use it to display markets. WebTrader is an HTML based, online platform which requires no downloads whatsoever. It has the advantage, therefore, that it can be accessed from any computer with an internet connection. While not as advanced as Trader Workstation, it does have some fairly useful features such as market depth displays, deep book data, market scanners, and other search features. WebTrader also allows you to access a huge amount of information on tradable securities such as real-time news, charts, fundamentals, analyst reports, SEC filings, and more. It has a customizable interface so you can make it your own. You can add/remove features to suit your trading style and strategy. Overall, Trader Workstation is the more advanced of the two and will be better for professional, active traders. It’s a shame the charts are a little clunky and they could be so much better, but that’s made up for by the fact you can use third party plugins and apps. WebTrader is on the whole, good, but there are some limitations as compared to Trader Workstation. Remember that you can still use this if you have an account, so it’s not an either/or choice and you can utilize both, for example, if you are away from your primary computer, you can log in to WebTrader and make trades. The overall design of the Traders Workstation depends on the mode you choose to view it in. The mosaic theme is very different from the classic view. Since most traders will utilize the mosaic view, we will base these comments on design on it. When you first log in and enter a symbol into the search feature, you will see a chart for that stock in candlestick form, as well as information about that stock such as the bid/ask price. To the right you can view your favourites, your watchlist, or US movers. You can of course add to or subtract from these tabs. In the bottom left you will see the latest market news. You can filter this to see news about your portfolio only. In the bottom right you can see your active trades and orders. You can also see settled trades giving you an overview of your overall trading success. It’s all very easy to navigate and move around. You can also add news windows at any time by clicking the blue ‘add window’ button at the top. The greatest customization feature of the Traders Workstation is the ‘windows’ feature in mosaic view. You can add and subtract various windows of information to have the platform set up in such a way that it provides you with all the information you need relevant to your own trades and trading style. You can also add third party plugins such as charting and fundamental analysis features to give you access to better tools. It’s rare to be able to customize your trading platform to this extent. This is one of the things which makes IB stand out from the crowd, although adding too many windows could make things cluttered and confusing, so be careful of that. Again, the charts let IB down. You will definitely want to make use of a third party plugin for advanced charting. There is an IB mobile trading platform compatible with all popular devices types (iOS, Android). Real time streaming of quotes and charts. Access to a wide range of markets including stocks, forex, futures, options, and more. Access to basic company fundamentals data. This can’t be viewed on Android tablets. Price alerts with e-mail notifications. The ability to take calls and the reconnect without having to log back in. There are almost always some limitations to mobile trading platforms as compared to their desktop counterparts, and IB is no exception, but as far as mobile platforms go this is very good. It’s well designed, it has most of the core important features, and it allows you to trade all of the same important markets. Remember that as with all mobile platforms, you are at the mercy of your signal strength. Get real-time alerts about your investments and trades. These include upcoming events that could have an impact on your portfolio such as earnings reports and company news. Allows you to understand how you are performing against a set of criteria set by you. This is very useful for finding out which areas of your portfolio are doing best, and which are under-performing. You can backtest your portfolio against up to 3 years of historical data and fundamentals. This can help make better trading decisions as you will see how your choices would have played out had you made them already. Since ETFs typically have much lower fees than mutual funds, you can search for ETFs which are performing to the same standard as a mutual fund you are interested in, and invest in those instead. If you wear an Apple watch, Interactive brokers can send alerts and trading information to this device. If you are managing client’s assets you can build custom portfolios and test them, rather than having to research and execute investments one-by-one. This would be a great time saver and allows you to keep track of everything in one place. This is pretty close to artificial intelligence. You can ask questions in plain language such as ‘What is my current P&L on trade X?’ and iBot will instantly answer you. As you can see, these are some pretty advanced and unique tools and aren’t available at every other broker out there. Some of them may be overkill and are there purely for reasons of novelty (like the Apple Watch feature) rather than providing definite utility, but, it’s interesting to see what’s on the cutting edge and Interactive Brokers certainly sits right on it. Placing live trades through the IB platforms is relatively simple and painless, and everything has been designed and set up for ease of use. It’s almost intuitively easy to understand, and there’s no clutter or overcrowding within the platform. The first step is logging in. You need to select Trader Workstation from the options, then enter your username and password. Every time you log in you will see the ‘daily lineup’ feature. This is something you will see every time, and which will give you a quick rundown of market conditions, trading activity, and analyst forecasts. This will bring up the mosaic view automatically. It's recommended you start with this view as you have more information at your disposal and you can customize it to suit your needs. If you want to get more data you will need to subscribe. The market data in the standard version is basic, and most traders will want to subscribe to extra data to make more informed decisions. You will then see real-time data for the markets you are interested in. You will see charts, tickers, news, and activities. You can use the search feature, entering any symbol you wish, to bring up the data on it. We like the whole process of using the Trader Workstation. It’s simple, streamlined, and customizable. What more could you want? Select the asset or security you want to trade, and click buy/sell on the mosaic order entry panel. You can trade at current bid/ask prices or set your own entry price. When you have selected your trade type (buy or sell) and the price you want to bid at, click the submit button to the right side of the panel. This will create the order. You can also set a stop limit before executing the trade. To exercise this option, click the advanced button. You must set this before clicking submit. You will then see an order summary. You will have to either click transmit to execute the order or cancel to change your mind. We found the order filling process to be very easy and fast. But we would like to see the stop loss’ feature outside of the advanced features, as one of the main options. Stop losses should be included in every trade, and having them in the ‘advanced’ tab could put some traders off using them. The charts at Interactive Brokers aren’t the best in the world, as we said earlier. However, making use of them is simple enough. The chart you will see in the mosaic mode will be linked to the active trade you have on. You may have multiple active trades on at the same time. In order to change the chart in view, simply click the trade in question. The chart will appear in candlestick mode by default. You can change the candle size from as little as 30 seconds to as large as weeks. You can also change the time period they cover from a single day to over a year. You have the ability to enter a chart into your ‘favourites’ making it easier it find again later. The charts could be a lot better, and for a platform attracting traders at the professional level, they should be much more customizable, and various different pieces of data should be featured on them. It is for this reason that many traders use third party plugins and apps when charting in Interactive Brokers. Overall though, it's a matter of taste and IB choices might be completely enough for you. The first point of research should always be the ‘daily lineup’ which will appear every time you log into your account. This is somewhat of a snapshot analysis and it would be unwise to make trades based on this information alone, but it’s a great starting point to get a feel for what’s going on and where the opportunities may lie. IBIS News Feature - Market news, bulletins, and the latest information from around the world. It’s real-time and accurate. Charts - You will want to subscribe to a third party charting app. The charts available through these plugins are much better and can plot technical indicators on them, among other things. Quotes - You can get real time quotes on endless securities. Just enter the symbol into the search feature. You can also set up watchlists to keep track of the securities you are interested in. Fundamentals Research Platform - There’s no better way to spot opportunity than by conducting fundamental research. Thomson Reuters provides the comprehensive fundamentals information on thousands of companies. Data includes business summaries, financial statements, analysts ratings & forecasts, dividend calendars, comparable companies, financial ratios, SEC reports, and other reports. The research tools available are excellent but will require a subscription. We think it’s worth it to get the best information and there is a free trial on most of these research tools. They are of an excellent standard and combined with the educational materials, you will be well positioned to make good trading decisions. Note that there are virtually no research tools available on the WebTrader versions as compared to the Trader’s Workstation. You can contact the Interactive Brokers support team 24 hours per day, 5 days per week via telephone, e-mail, and live chat on the site. While the other two support features are available on Saturday, telephone support is not. On the whole, the level of support is good and responses are quick and helpful. There’s always room for improvement, of course, and in and around big events where lots of trading activity is happening wait times might sometimes be longer. The educational materials on offer at IB are second to none we have seen anywhere else, and there’s an extensive range of high-quality videos and documents supplemented by webinars, apps, tools, widgets, and entire courses on many trading related subjects. In a nutshell, IB is traders paradise from a learning perspective. Even those who have been trading for some time will likely find something they can learn from. We recommend creating an IB account sheerly for access to the learning materials if nothing else. They are that good. We have no criticisms regarding the educational materials at IB. Interactive Brokers is a cut above average when it comes to trading platforms, and would definitely be classed as a ‘major league’ platform. With the huge range of securities you can trade across global markets, the extensive and unique tools to help you along your way, and some of the lowest fees in the business, it is easy to see why IB has become an industry leader. It’s not perfect, and better charts would be a good thing at the least, as well as lower barriers to entry financially, but it is definitely among the best we have seen and well worth checking out if you have the capital to get started. You will struggle to find a better all round trading platform elsewhere.